The cars in the standard and the large car categories are available in both AC as well as non-AC type. 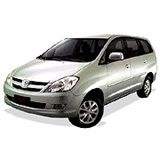 The cars in mid-size, full-size and luxury categories are available only in AC type. Below are the cars shown in each category. We will provide the shown car or an equivalent car from the same category. The car provided will be driven by a highly efficient and very courteous driver.